MISSISSAUGA, ON, Oct. 2, 2018 /CNW/ - Maple Leaf Foods Inc. (TSX: MFI) ("Maple Leaf") today announced that it has signed a definitive agreement to acquire VIAU Foods ("VIAU"), a Canadian market leader in premium Italian cooked, dry-cured and charcuterie meats for a purchase price of $215 million, including $30 million in Maple Leaf stock. With sales of $180 million over the last twelve months, the transaction is expected to be accretive to Maple Leaf's earnings per share in the first year and to the Company's margin expansion over time. "VIAU brings a portfolio of leading brands, a reputation for innovation and quality, skilled management and people, and excellent manufacturing assets," said Michael McCain, President and CEO of Maple Leaf Foods. "This acquisition expands Maple Leaf's position in the growing market for premium dry cured and pepperoni meat products and provides further production capacity in Quebec, an important strategic base to grow both Canadian and U.S. sales. It also enables VIAU to expand its portfolio to include raised without antibiotic products, leveraging Maple Leaf's leadership in this growing market." "It is with great pride that we join the Maple Leaf family," said Pat De Marco, President and COO of VIAU. "Our quality and food safety culture fits perfectly with Maple Leaf, the company that, for years, we have regarded as the Canadian industry leader. The resources that Maple Leaf brings will allow us to more quickly grow our business, provide additional product offerings to our customers, make further inroads into the U.S. market, and provide more opportunities to our people. We are truly excited about the future possibilities." Established in 1977, VIAU produces a range of value-added prepared meat products including Italian cooked meats, sausages, pizza toppings, shaved steak and meatballs, and is the Canadian market leader in cooked and dry-cured pepperoni. It also produces a range of gourmet deli and premium charcuterie products including salametti, capicollo, pancetta and sliced chorizo. VIAU is a leading supplier of dried pepperoni and other pizza toppings to the North American foodservice industry and markets its products through retailers across Canada. The company employs 470 people at its two Hazard Analysis Critical Control Point (HACCP), United States Department of Agriculture (USDA) and Safe Quality Food (SQF) accredited facilities in Laval and Montreal. It follows leading food safety practices, supported by an on-site ISO accredited laboratory. The business will continue to be led by the current highly experienced management team. The transaction will be financed through a combination of cash-on-hand and drawings under Maple Leaf's existing credit facility and is expected to close in December, subject to regulatory review. This document may contain "forward-looking information" within the meaning of applicable securities law including statements regarding: accretion to Maple Leaf's earnings in the first year of operations, long-term improvement in Maple Leaf's margins, expansion of VIAU's portfolio to include raised without antibiotics products, and incremental business growth penetration of the US market. These statements are not guarantees of future events and involve assumptions and risks and uncertainties that are difficult to predict. Some of these assumptions and risks and uncertainties are described in more detail in the Company's filings made with the securities regulatory authorities in Canada which are available on SEDAR at www.sedar.com. Actual results may differ materially from those expressed, implied or forecasted in such forward-looking information and there is no assurance that any such future events will occur. Maple Leaf does not intend to, and Maple Leaf disclaims any obligation to, update any forward-looking information, whether as a result of new information, future events or otherwise, except as required by law. 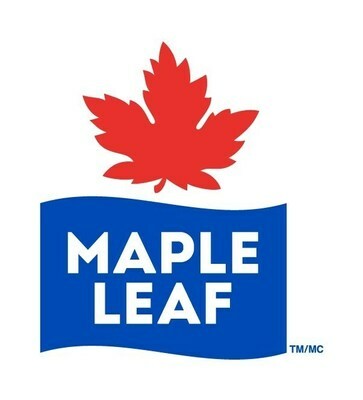 Maple Leaf Foods Inc. is a leading consumer protein company, making high quality, innovative products under national brands including Maple Leaf®, Maple Leaf Prime®, Maple Leaf Natural Selections®, Schneiders®, Schneiders® Country Naturals®, Mina®, SWIFT®, Lightlife™ and Field Roast Grain Meat Co.™. Maple Leaf employs approximately 11,500 people and does business in Canada, the U.S. and Asia. The Company is headquartered in Mississauga, Ontario and its shares trade on the Toronto Stock Exchange (MFI).